Page revised in February 2017. The locations covered in this section were visited in March 2013. You may wish to see an introductory page to this section with a map or a page with some information on the Jewish settlements in Galilee after the Second Jewish Revolt (132-35 AD) first. 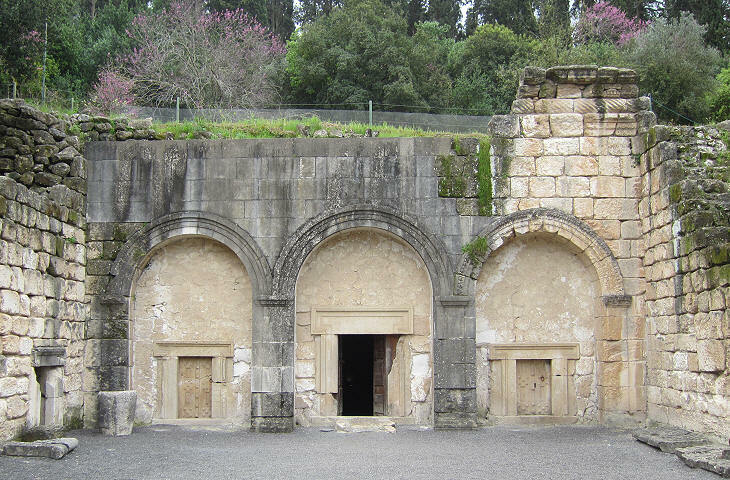 The archaeological park of Bet She'arim is situated on the slopes of Mount Carmel, a few miles south-east of Haifa. 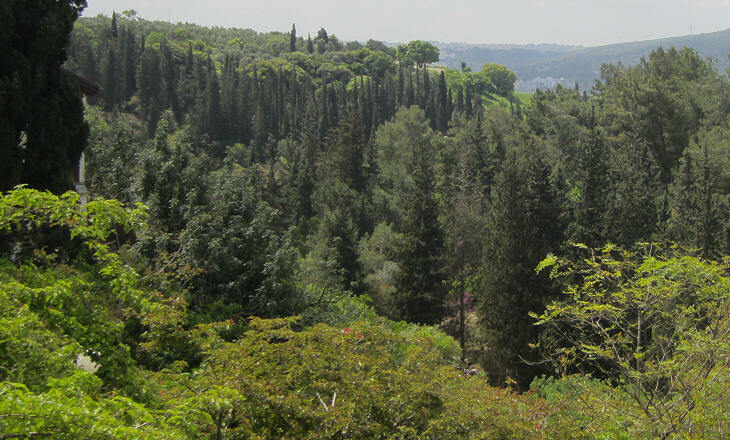 The landscape of the area, thanks to afforestation efforts by Jewish organisations and advanced farming, has an almost Tuscan appearance. Many detached houses for commuters to Haifa add to the countryside a touch of Surrey. 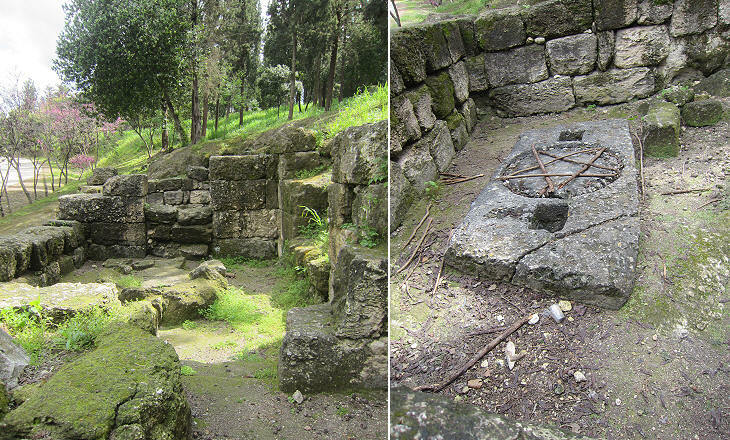 The site of an ancient settlement was discovered by chance by Alexander Zaid, the first Jewish settler in the area in the 1930s. 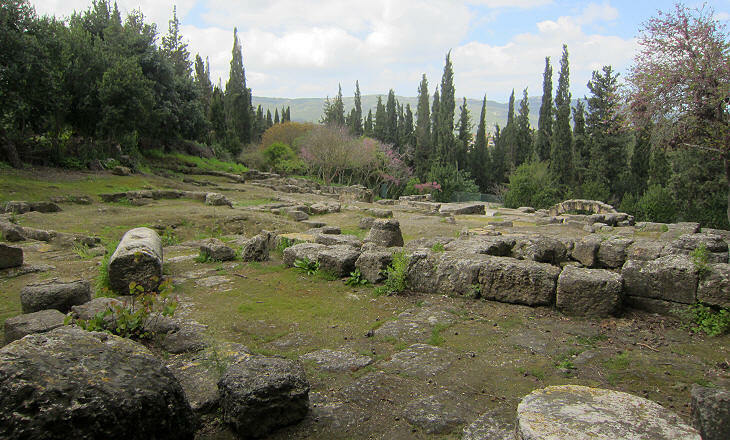 Excavations carried out in 1953-57 identified a small Jewish village which flourished between the IInd and the IVth century AD, a period of economic development for the whole of Galilee. Wheat farming was the main agricultural activity of the region, but the hilly landscape of the area around Bet She'arim was not suited for that crop and probably the villagers earned their living by making olive oil. Limited evidence of ancient buildings and countryside fine views would not attract many visitors to Bet She'arim if a large necropolis had not been found on the slope of the hill beneath the village. 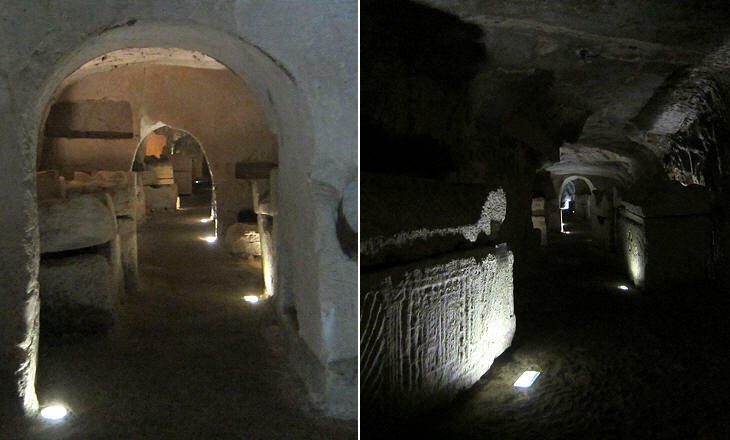 It is made up of some 30 burial caves excavated in the rock and complemented by walls and supporting structures. 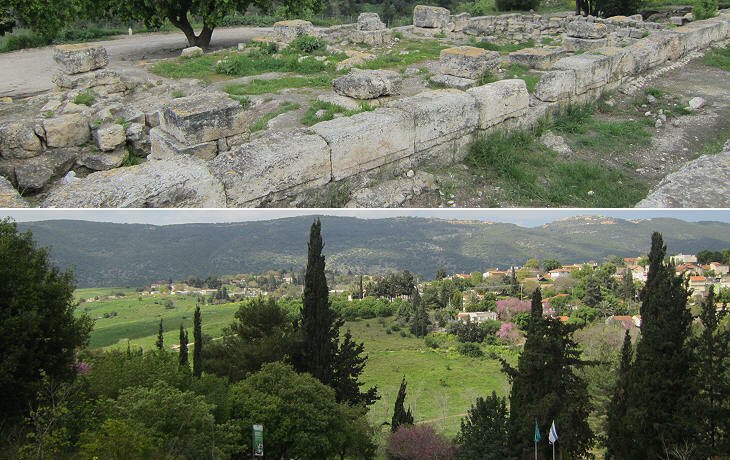 The whole necropolis originated by the decision of Rabbi Yehuda Hanasi (aka Judah the Prince), who chaired the Sanhedrin at Sepphoris, to be buried in this village where he had lived for many years. He was a very wealthy man and he was regarded as the leader of the Jews of Galilee. He established good relations with Roman authorities and it is said he was on friendly terms with Emperor Marcus Aurelius. He died in 217 so the whole necropolis was developed after that year. The fame acquired by Rabbi Yehuda Hanasi led other pious (and wealthy) Jews to arrange to be buried next to him. The inscriptions found by archaeologists indicate that the people buried at Bet She'arim came from all parts of Galilee and some from rather remote locations such as Palmyra. 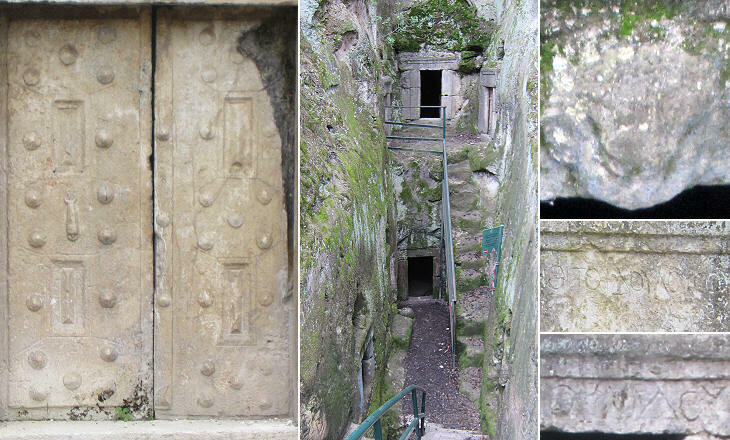 The caves were carefully excavated and heavy basalt doors closed their entrances thus giving them the appearance of houses. 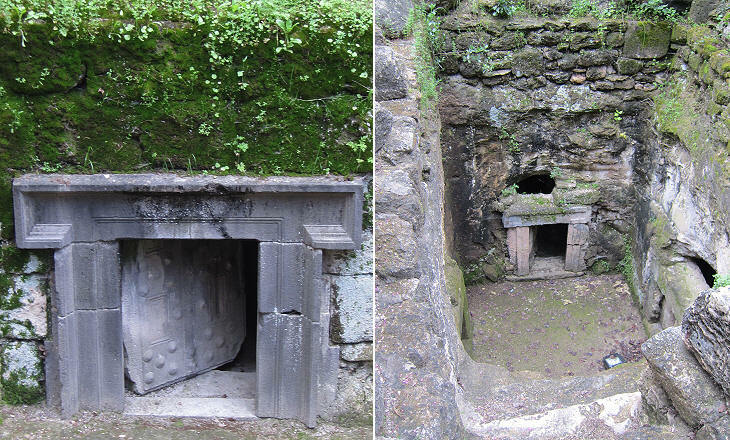 In the images above one can see that tomb looters were unable to move or break the doors and made holes above them to penetrate inside. 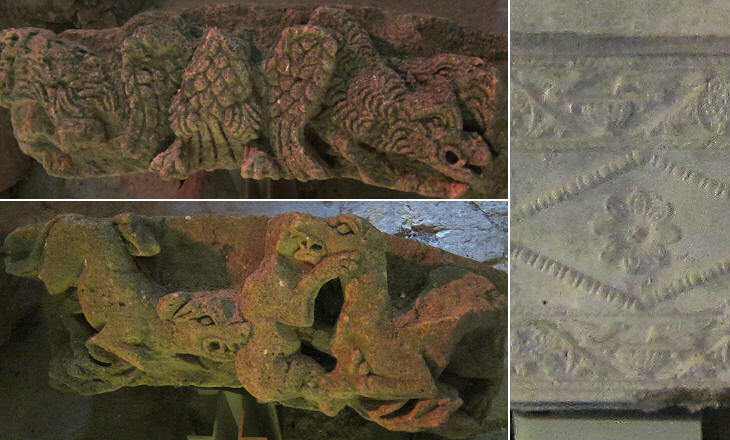 The lintels of the entrances were decorated with inscriptions and in some cases with small reliefs. A lot of care went to the basalt doors to give them the appearance of a wooden door decorated with large nails and even a knob. This usage was not limited to Palestine but can be seen in Syria too. The image used as background for this page shows another basalt door. 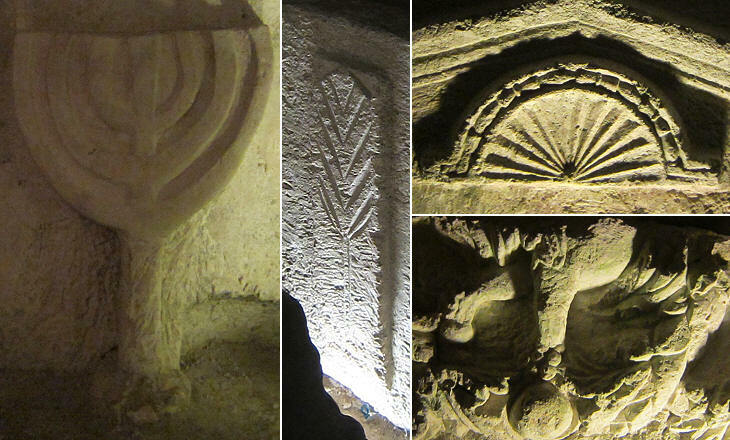 While some caves were family tombs the most impressive one, where 135 coffins have been found, was probably reserved for Jews living abroad who wanted to be buried in Israel (today this wish by many American Jews supports a sizeable business). 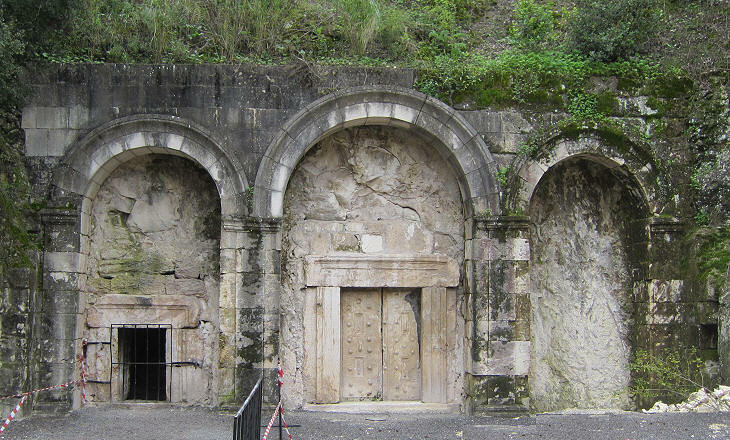 The entrance to the cave was given a basilica-like appearance by building a façade of white limestone. On the right side a fragment of an elaborate cornice is still visible. The initial size of the cave was enlarged by excavating additional galleries in all directions. The bare rock was often plastered and walls and arches divided the space into separate areas. The heavy coffins are usually laid at the sides of a central corridor, but in some instances they seem to block the passage (maybe looters moved them). Burial in the ground is the prescribed way for disposing the dead in the Jewish religion, but the practice of using sarcophagi was adopted by some Jews when it spread through the Roman Empire where it replaced cremation. 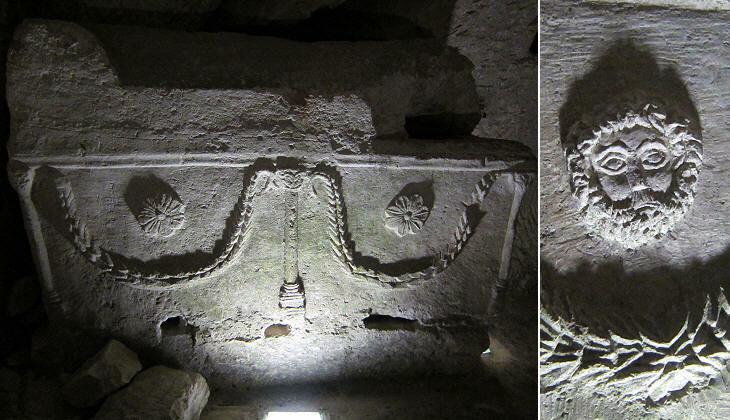 In Rome some forty Jewish sarcophagi have been found. 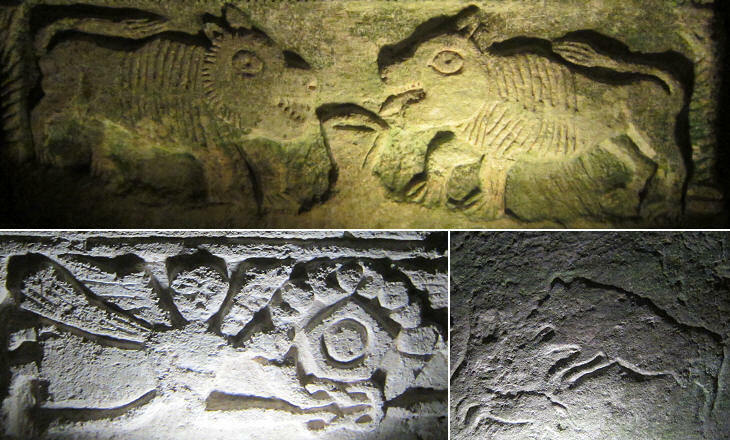 In general they were decorated with imagery similar to that of pagan sarcophagi. Because of the very uneven quality and type of the reliefs which decorate the coffins at Bet She'arim it is possible that some of them came from large towns where more skilled workmanship was available. Jews shared to an extent with the pagan "man in the street" knowledge of the Greco-Roman pantheon with its colourful gods. They may have detested the idea of invoking these immortal pagan supermen, but when it came to artistic fashion, some Jews were receptive to what was in vogue in contemporary pagan society. Leonard Victor Rutgers - Archaeological Evidence for the Interaction of Jews and Non-Jews in Late Antiquity. 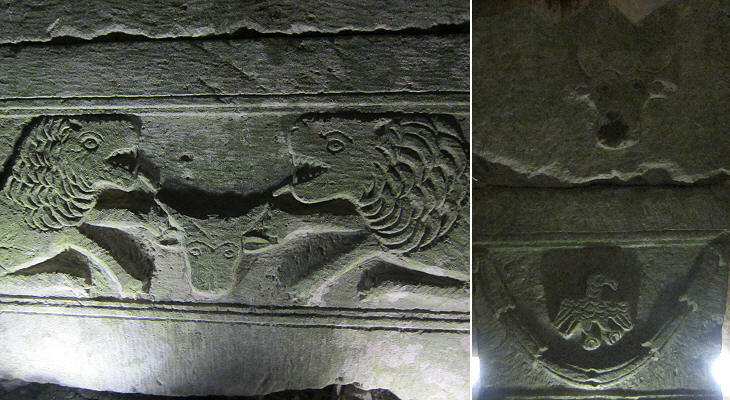 Lions, winged victories and perhaps even a boar (you may wish to see a spectacular sarcophagus depicting the hunting of the Calydonian boar at Eleusi) are some of the pagan images (all above) which decorate the coffins; in comparison the Jewish symbols (menorahs, palm leaves - below) are rather few and executed in a very poor way.